Took this photo of all the tools I had used today. Although I was engaged in just one specific and basic task – attaching clay sprigs to the surface of large thrown pots, when it came to washing down, I was struck by the variety of different utensils employed. Had a relaxing and rewarding day making animal sprigs to be applied to the surface of some large brick clay pots. The decoration is intended to illustrate food stuff from the Medieval era and the pots will eventually end up in the St John Medieval Museum installation. Experiments with pottery bones and ceramic sound pots. St John Medieval Museum has an enigmatic skeleton under the floor boards that visitors can view when a section of the floor is lifted. Got myself a digital sound recorder and spent an afternoon deep in the bowels of the Cider Museum attempting to record ’10 green bottles’ on, you guessed it, ten green bottles! So quiet down there in the basement. Artist blacksmith Andrew Findlay popped in today to measure each of the fired apples for their bespoke bronze core and leaf. …..hanging on the wall – well, standing on a picnic bench actually! Managed to get a tune out of x6, just a tad annoyed I didn’t have another two bottles to get the whole range of notes needed for 10 green bottles. Trial & error…lots of error! I thought it would be a doddle making the final sections for the apples yesterday – how wrong was I!? Even though I have well over 20 years of making things on the potter’s wheel, it took me a couple of hours to suss out the technique without the clay warping and collapsing. New shapes – new ways of working! As both antiquarian and more recent studies have noted, bells played a central role in medieval Christianity. 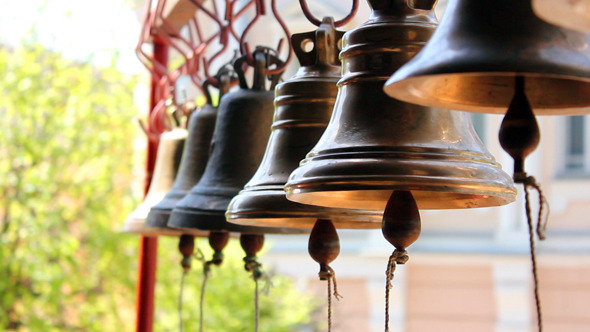 The history and meanings of church bells are more complex than often assumed. Drawing on a mixture of archaeological and textual material, the article demonstrates that a variety of types of bell—and indeed other signaling devices—were found in early medieval Christianity, and argues that the social and spiritual meanings of bells, whilst in some aspects determined by liturgical texts of the eleventh century, could also vary markedly depending upon the context, use, and reception of their sound. A bell calling a community to prayer was thus not simply “marking” the hours; it was summoning and producing the spiritual community, and its voice could be contested and even on occasion rejected!